It's official - the latest ABS demographic statistics released today show the annual rate of population growth held steady at 1.4 per cent in the first quarter 2016. 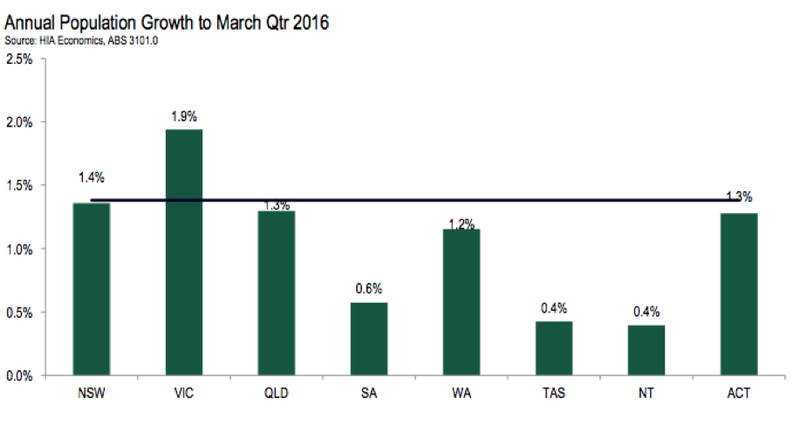 However the Housing Industry Association (HIA) said the wide divergences between the states and territories remained. The ABS figures confirmed that Australia’s population broke through 24 million during first quarter of 2016, with an estimated resident population of 24.05 million at the end of March. This was an increase of around 327,600 people over the year and amounts to 1.4 per cent annual growth. Source: ABSNet overseas migration (incoming minus outgoing migrants) contributed 180,847 people to the increase over the year ending March 2016, and the net inflow was around 2 per cent higher compared with a year earlier. Natural population growth (births minus deaths) added 146,763 people to the population over the year to March 2016, which is down by around 5 per cent compared with the previous year. HIA Economist Geordan Murray said with growth of 1.9 percent over the year ending March 2016, Victoria has the fastest growing population in the country with over 6 million people now calling Victoria home. “New South Wales was second fastest with growth of 1.4 per cent, while Queensland posted the third strongest rate of population growth of 1.3 per cent,” he said. Migration data. Source: ABSMr Murray suggests that it’s no coincidence that these three states have also been the strongest performing economies over the last year. For him, it’s also not surprising that the country is seeing more people being drawn to the jurisdictions with better performing economies, where the population growth has been instrumental in generating the additional demand that underpins strong economic performance. “South Australia is in a contrasting position to the east coast states, with population growth falling to the lowest rate in more than a decade," Mr Murray said. "It’s a real concern that the number of people leaving South Australia is high and rising - productive workers are leaving for better opportunities interstate. This is an additional headwind that must be averted if the state’s economy is to begin firing again. 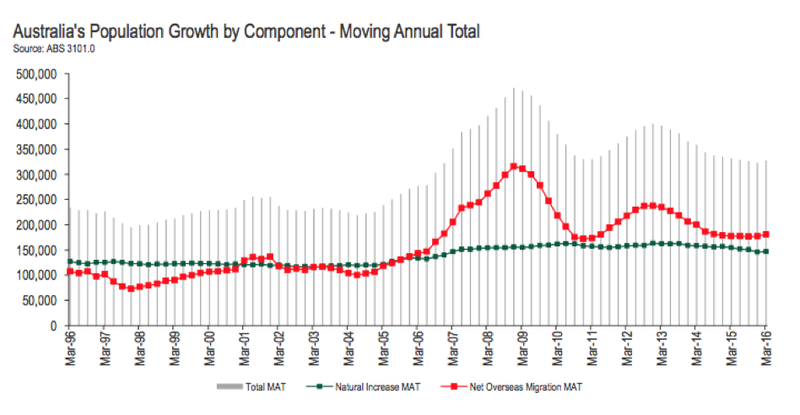 “After peaking in the wake of the financial crisis, the flow of inward migration to Australia slowed over the years that followed. "However, the contribution to population growth from net overseas migration appears to have levelled out at around 180,000 people per annum. "While this is higher than the average of around 160,000 per annum over the last twenty years, it is markedly down from the recent peaks. “A productive and growing workforce is fundamental to Australia’s economic performance - if Australia’s migration policy is mismanaged, this fact will become increasingly evident as the baby-boomer generation exit the work force and become more dependent on publicly funded services. 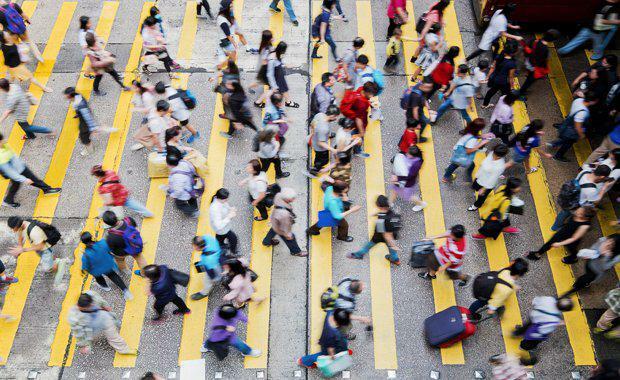 “Australia’s future prosperity is linked to our capacity to attract skilled migrants, but there are many dimensions to this issue, including how we house a growing population. "Our policy makers cannot afford to be afraid of having these discussions with the community, so Australia needs a well-articulated plan for population growth and the role that overseas migration needs to play.” Murray concluded.